← We did it ! 1000 Subscribers – From Youtube! Leaving an abusive relationship is difficult, but being alone can feel worse. All your happily married friends are still happily married, and here you are suddenly single. It’s a huge adjustment. Even though you’ve triumphed by getting out of a bad situation, there’s often an underlying sense of failure. There’s enormous pressure to be a couple in this society. When I was single, the worst part wasn’t loneliness. It was the remarks from people who wanted to know when I was finally going “to hook up for real,” and the warnings from an aunt that I wasn’t getting any younger. The worst comment came after I’d broken up with a man who undermined my confidence, did not turn up when he said he was going to, slapped me so hard my ears rang, and threw a glass of wine in my face. A colleague told me that I could not possibly last without him. “You think you’re happy, but you’d be much happier with a boyfriend,” she said. Maybe you’d like to meet someone new, but the idea of dating makes you nervous. You certainly don’t want to end up with another abuser. Women tend to attract the same type of person again and again, unless they take steps to do otherwise. That was my story, anyway. After seeing a series of men who ranged from being abusive to emotionally distant, I decided that it was time to stop dating. I would become my own boyfriend. I started treating myself the way the dreamiest man in the world would. The results were fantastic. Two months later, I began my first healthy relationship with a man. 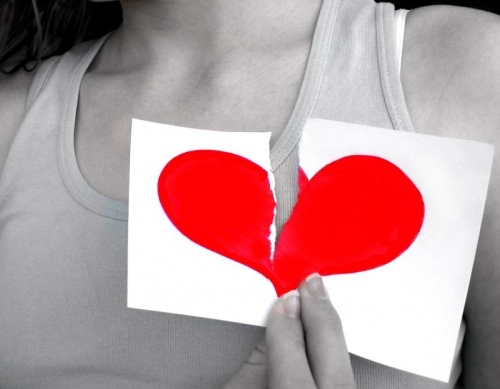 I never did fall in love with him, though, so I broke it off. Then the man who would become my husband walked into the picture, starting the most fulfilling relationship I have ever known. What’s more, it’s an easy relationship: no drama, no angst, and no mind games. We’ve been happily married for 12 years. If all your relationships have been unhealthy, you may not believe that you are capable of a healthy one. Maybe you don’t even know what a happy and mutually supportive relationship is. Find a pen and paper right this minute and write down the qualities your perfect man would possess (hint: he’d be loving, honest, faithful, gentle, and so on). Now write down how you’d feel in a relationship with such a person (peaceful, content, joyous, excited, and so on). Keep these lists with you at all times. Dwell on them whenever you have a minute, perhaps in the ladies’ room at work. It’s especially helpful to read them–and feel the emotions they bring up–for a minimum of 30 days. Do this as you drop off to sleep at night and before you put your feet on the floor in the morning. Your subconscious will go to work on drawing a man with these qualities to you. It may sound like hocus-pocus, but it works. Make a list of your own excellent qualities. Bring to mind every important compliment you’ve ever gotten. Recognize that you deserve a healthy relationship. Understand that you are worthy of love, respect, tenderness, and whatever else was missing from–or inconsistent in– your former relationship. A lot of us have been raised to think it’s conceited to dwell on our good qualities, but you if you haven’t a sense of your own worth, you really can’t attract a man who will give you the love you deserve. It’s imperative that you overcome your own feelings of inadequacy before you date again, or you’re bound to end up with your ex in a different body. Now is the time to do all the things your ex held you back from, whether that means going to a museum or eating in a particular restaurant. Perhaps you’ve dreamed of vacationing in Malta, but your ex insisted on a fishing trip every year. If you can afford it, pencil in some vacation time and go for it– by yourself. After I decided to become my own best boyfriend, I took myself to San Francisco for four days. I booked a room in a B&B instead of a hotel because I’m shy; the communal breakfasts forced me to talk to other people. As a result, I went sight-seeing with a dancewear designer from South Africa. I enjoyed several meals with a Londoner who’d sold her furniture business to travel around the world. When I returned home to New York, I had a completely new outlook. I felt capable, powerful, and independent. Traveling by myself had a pronounced impact on my subsequent relationships with men; I was no longer willing to take anything less than the finest treatment from them. A friend’s lovely boyfriend once told me, “You’re not an adult until you’ve seen a movie by yourself.” After my last rotten relationship, I took myself to see “Rain Man.” Yes, a couple of less-enlightened jerks did look at me pityingly, but I didn’t care. I walked out of the theater feeling great, even if the movie was overrated. I started going on solo trips to the movies once every couple of weeks, and it was absolutely freeing. I didn’t have to compromise with anybody about what film to see, and I genuinely enjoyed my own company. I began to feel that I could do whatever I wanted. Once a week, pick out an inexpensive bouquet from the corner grocer. Stop making excuses. Stop telling yourself you can’t afford it, that you should spend your money on something practical, and just buy it. Take it home and put it in one of those empty vases you have lying around. The flowers will cheer you every time you see them. They will make you feel loved. There’s nothing quite like a night out with the girls. If you managed to shut out your friends while you were with What’s-His-Name, you may have some apologizing to do. So go to it, and resolve never to let a man get between you and your friends again. Then, go out and have a blast. Do it often! You deserve it. Talk to yourself as you would a beloved child. You wouldn’t tell a little one, “You’re so stupid,” or “You’re fat,” so stop saying such things to yourself. Speak to yourself–and treat yourself–like a perfect soul who is progressing every day. A baby doesn’t come into the world with the ability to talk, but it learns eventually. Treat yourself to something wonderful every chance you get. It doesn’t have to cost money. Lose the guilt and eat your lunch in the park instead of tying yourself to your desk. Take a walk in the evening and discover a different part of town. Do things that feel good. If you have the habit of eating takeout because you don’t like “to cook for one,” it’s time to impress the most important person in your life. Cook yourself something simple and delicious. Set the table (no standing over the stove and eating out of the pot) and serve it on your best china. Enjoy it with a single glass of the most delightful wine you can afford. Yeah, yeah, yeah, you’ve heard it before, but it really does make a difference. Everybody has a special interest, and it’s time to explore yours. You’ll develop confidence, meet new people, and most important, get out of the house on a regular basis. When my friend Brian found out that his girlfriend had been cheating on him for 15 years, he packed up her things and listened to sad music for two weeks. Then he moved on. His interests are cooking and the outdoors, so he enrolled in a cooking class and joined a hikers’ club. He made friends through both activities and, before long he was inviting them to his house for dinner parties. One night, a guest brought a female friend along, and Joe fell in love with her. They got married two years ago. After being your own boyfriend for a while, you may want a relationship with a man again. (Or maybe you won’t.) When you’re out on dates, ask yourself if the guy exhibits any of your ex’s qualities. Abusers are utterly charming in the beginning, but they leave clues that indicate they’re not good boyfriend material. Observe carefully. Never make excuses for poor behavior. Ask yourself if the guy is the kind of man you’d like your daughter to marry (whether or not you have one). If the answer is no, give him the slip. Continue to be your own boyfriend until the right fellow shows up. Eventually, he will. Make time to develop a loving relationship with yourself, and the bad boys you once found irresistible just won’t appeal to you anymore. You will magnetize gentle, fun, upstanding, faithful men, and you’ll be attracted to them, too, for a change. Before you know it, you’ll find yourself in the relationship of your dreams. I did it, and so can you. Gallery | This entry was posted in Physical & Emotional Abuse and tagged abuse, because i love you, breaking up, dating, depression, divorce, domestic violence, emotional abuse, etobicoke, hypnotherapy, hypnotist, i love you, love, me, moving on, north york, personal, Self-Help, toronto. Bookmark the permalink.